Dark chocolate lovers, today is your lucky day. I’m here with good news regarding your beloved sweet treat. Today, I’m here to tell you to eat and enjoy that dark chocolate with zero guilt. Because yes, dark chocolate has proven to do a body good! Made from the seed of the cocoa tree, dark chocolate is one of the best sources of antioxidants on the planet. Loaded with nutrients that have been scientifically proven to positively affect your health, dark chocolate has even been coined a “superfood”! But, it is important to recognize that not all chocolate is created equal. Highly sweetened, overly processed, drug store chocolate will not compare and will not provide you with any of the health benefits I’m about to outline below. Studies show that the darker the chocolate the better it is for you. Shop for organic dark chocolate whenever you can and always be sure that the chocolate you are purchasing has at least 65% cacao. This will ensure you’re reaping all those amazing health benefits. We keep dark chocolate bars on hand at our house permanently! I met my match with my husband Jonathan and his love for dark chocolate. He keeps at least 8-10 chocolate bars in our refrigerator at all times! 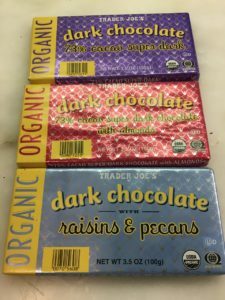 We love the organic dark chocolate bars from Trader Joe’s. Some with nuts and raisins, some without. They are organic, delicious and only $1.99 a bar. You can’t go wrong! I love my dark chocolate cold from the refrigerator too and I enjoy 2 squares a day with a hot cup of tea. Zero guilt and the perfect healthy answer to my sweet tooth. My family loves when I add dark chocolate chips to my banana bread, my sons truly believe that it’s not the same without. I “truly” believe that they have no idea how good it is for them! HA! It’s nutritious: Dark chocolate is loaded with minerals and also a decent amount of soluble fiber. Quality dark chocolate is a good source of iron, magnesium, copper, manganese, and fiber! Powerful Source of Antioxidants: Dark chocolate is full of organic compounds that are biologically active and function as antioxidants. Free radicals in the body, dark chocolate has been proven to be higher in antioxidants than almost all other foods. 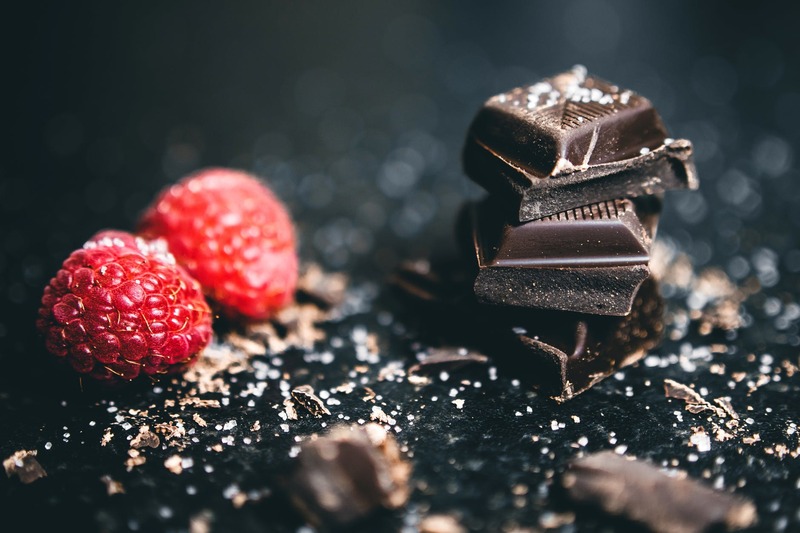 Improves Blood Flow and Lowers Blood Pressure: Because dark chocolate contains flavanols, which stimulate the lining of arteries, it is thought that dark chocolate can help to improve blood flow. Additionally, the bioactive compounds in cacao have also shown to decrease blood pressure in small amounts. If you’ve followed me for a while now, you know that I have struggled my whole life with high blood pressure. I truly believe that the small portion of dark chocolate that I consume daily really helps to keep my blood pressure down. So much so that we travel with it! I can’t tell you how many dark chocolate bars have been throughout the USA and abroad with us! We never leave home without it!! Improves Brain Function: Dark chocolate may increase the function of your brain! Studies have shown that eating high-flavanol cocoa for five days improved blood flow to the brain. It also contains the stimulants caffeine and theobromine which is probably why it can improve brain function in the short term. Combats Cholesterol: Dark chocolate can help combat heart disease and here’s why…Dark chocolate improves several important risk factors for disease. It lowers the susceptibility of LDL (bad cholesterol) to oxidative damage while increasing HDL (good cholesterol) and improving insulin sensitivity. Improves Skin Health: The bioactive ingredients in dark chocolate may also be good news to your skin. The bottom line here also has to do with blood flow. Because flavanols increase blood flow to the skin, the have been proven to help protect the skin against sun damage and increase the skins hydration and density. Beach vacation, check! Dark chocolate in your suitcase, check! I’m sure I could go on and on regarding the scientific backing behind all the health benefits that legitimate dark chocolate can bring to your daily diet but I think there’s enough here for us to rally behind! As always, I encourage you to enjoy in moderation. Yes, calories and fat accompany almost anything that tastes this good. But, in this case, when eating responsibly, the good here definitely outweighs the bad.